Nick Nostitz reflects on photographing the political rise and fall of Thailand's first female PM. An open letter to General Prayut Chan-ocha, signed by 418 concerned scholars. 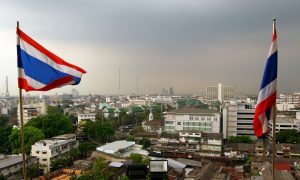 The Washington–Bangkok rapprochement permanently threatens Thailand’s already struggling democracy. The UNODC’s ambassador for rule of law in Southeast Asia might consider focusing her advocacy on those locked up for criticising her family and its pets. Experts discuss Nicholas Farrelly's Lowy Institute paper on the outlook for Thailand's junta. How the junta's urban development plans target the poor and their politics. The creativity, informality, and disorderliness of Bangkok's street vendors couldn't survive the junta's impulses for social control. Pavin Chachavalpongpun: Vajiralongkorn has been ruthless in consolidating his position within Thailand's ruling elite. Why Phra Dhammajayo does not turn himself in. Skydiving, insubordination and rule under the new king. Thai Ambassador to Australia responds to James L Taylor article. A temple, illicit money, and the military junta.